This year we are thrilled to partner with our friends at Craftcation on their sixth annual business and makers conference happening April 27-30, 2017. Each year they gather up makers, artists, DIYers and creative business owners in the beach city of Ventura, California (just a little north of Los Angeles) to get away and learn new craft and business skills. This year we helped them create tracks from the schedule of over 100 workshops and activities-- and OMG it was crazy to sort through all of the stellar classes they have lined up! Putting the tracks together showed me that there's something for everyone at Craftcation. One thing that I am really excited about is that Isaac and I will be hosting "Think Tanks" which are versions of our peer-driven product and design roundtables. And we are SUPER excited to have the design geniuses at Aeolidia present at two of those. If you're going to Craftcation and need to work out ideas and problems, you'll want to make sure that you try to get to one of them! If you aren't going to Craftcation but want to-- good news, registration is still open and you can register here! If you're a member of Academy of Handmade, you get a discount too (you've just got to go search for it in the forums). And if you aren't going this year, start saving up for 2018 because you won't want to miss it! If you're just starting out in your creative business, Craftcation is the perfect place to get your feet wet. This track features classes we think are essential for you to know the basics! 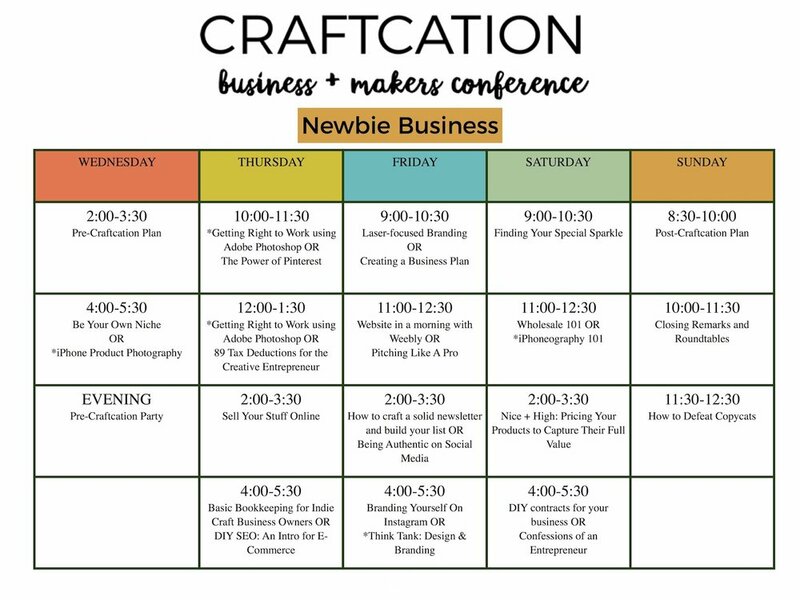 This year Craftcation is PACKED with so many amazing brand classes that we were easily able to make it its own track. Learn how to stand out from the pack from folks like Lela Barker of Lucky Break Consulting, plus take creative classes that can help support your brand! Craftcation attracts many a blogger and influencer. Learn creative skills that can easily be applied to the life of a blogger or influencer, plus take helpful business classes to keep you competitive! Are you a creative business owner who's got some basics down but is maybe a tad to very burned out? This track is meant to renew your business sense! A lot of introverts are in the creative community-- shocking, I know! And so there a quite a few attending Craftcation, which is what inspired us to create this track. Even though the conference is friendly and easy to meet new people, days of classes gets a lot of your creative and social energies out. If you're the kind of person who needs to balance the social and creative, then this track is for you! You'll get to experience Craftcation and not be exhausted when you get home. I really do hope you will join us. And if you've already purchased your ticket, I can't wait to meet you! View all of the tracks and plan your Craftcation schedule with this download here.